So it’s Christmas time in Southern California, which means Santa Ana Winds, Wildfires and “Die Hard”. 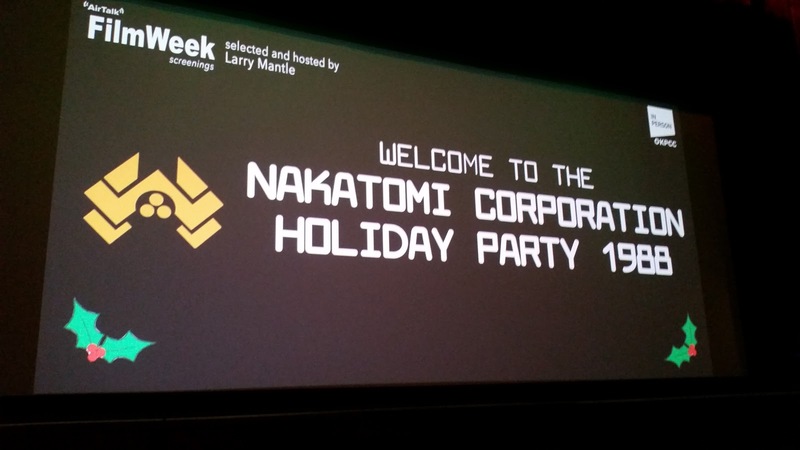 We were accidentally invited to the Corporate Christmas party for the Nakatomi Corporation last night. The event took place at the beautiful Theater at the Ace Hotel. We had been to this venue back in the Spring for a Radiotopia event featuring “The West Wing Weekly”. 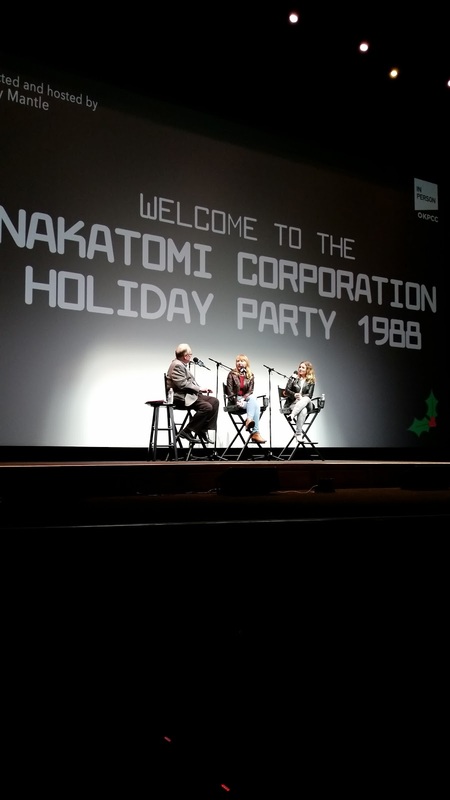 Last night however was a different thing entirely, a screening of that perennial holiday classic “Die Hard“. 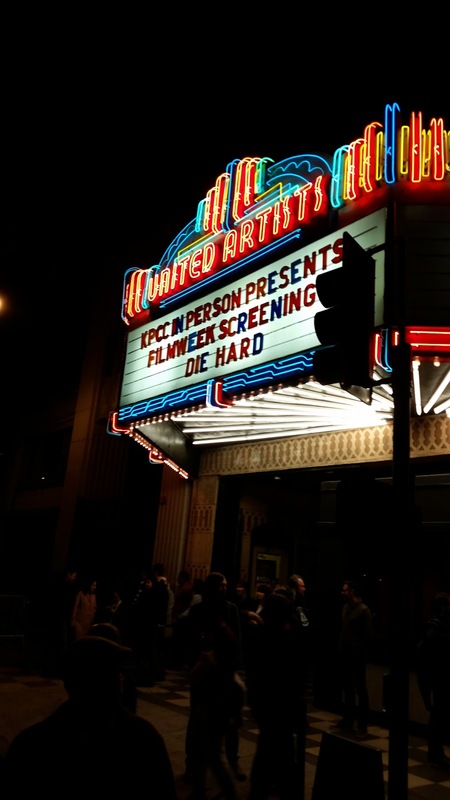 The event was part of KPCC’s Screen Week Film series. Most of the attendees were listeners to that public radio show found here in the Southland. The radio host Larry Mantle, presented a discussion after the film with two critics who appear regularly on the KPCC show. It was a light hearted salute to the film where the two women who clearly had not seen the film in it’s original run , praised it as a perfect action/popcorn feature. One woman is a critic at Variety, and she had some insights on how the movie had originally been received by critics in 1988. The second woman was a writer at Rogerebert.com, and she told some background stories about the films development. I wish I’d written their names down one was Amy and the other I think was Christine. I looked for data on-line but I could not find it listed in the program notes. 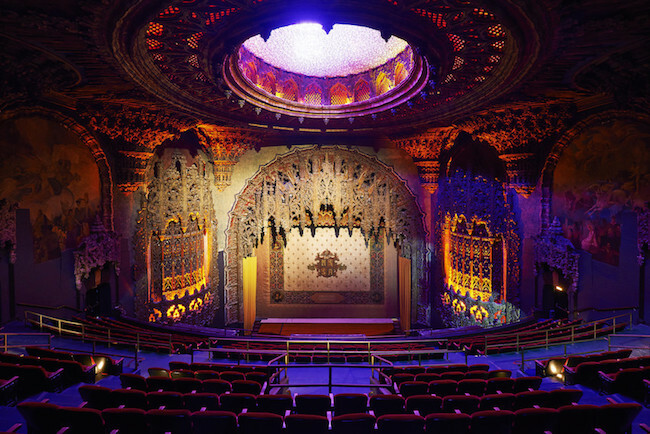 The Theater at the Ace Hotel was formerly the United Artists Theater in Downtown Los Angeles. It was built in 1927 and it features a huge orchestra level floorplan and two balcony ares. It seats 1600 people and last night it was close to capacity. If you have never seen Die Hard with an audience, you are missing something. Maybe this crowd was hyped up because it’s Christmas time and they are mostly subscribers to the station, but they were definitely a receptive audience. 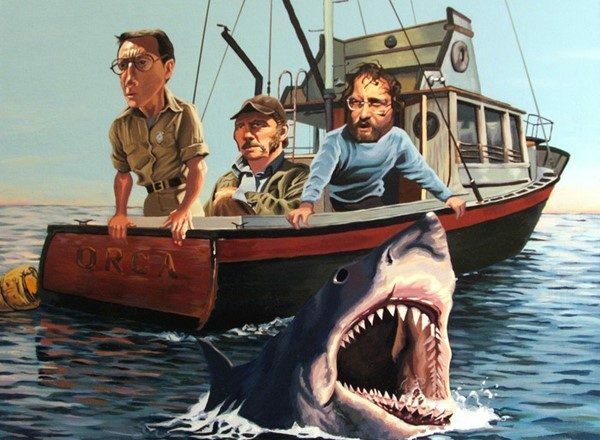 We whooped it up when Hans arrived, when Karl is killed, when John jumps off the building, and we laughed loudly at every L.A. cliche you can spot in the film. Argyle got a huge share of laughs and every bad guy death seemed to get a cheer from the audience. Al Powell practically got an ovation in the last scene. I was on a podcast just two weeks ago where we rhapsodized about the film for nearly an hour and a half. If you like, the link is HERE. were Brits who were not familiar with the Run DMC Christmas hit, “Christmas in Hollis” so for them I have included the following music video, which by the way was featured in the pre-show entertainment for the Shane Black event last Sunday. I’ve seen Die Hard so many times it is hard to count, but last nights experience was one of the best. The theater was beautiful, it was packed and the sound combined with the big screen accomplishes exacly what you want, an immersive experience. Just as promised, it will blow you thru the back wall of the theater. Merry Christmas to all and to all “Die Hard”. Oh, this sounds like a great evening was had by all. Sorry I missed it, but teed the blu-ray up when I finally got home. Aces! We missed you. The screening was great. Catch you next time. What a cool event! It cracks me up when people ask if DIE HARD is a Christmas movie…of course it is. Also one of the first Rated R movies I ever saw, we had to sneak in and I was really nervous about it. Those were the good old days, buying a ticket to the PG film and walking into the R. I saw a poll of folks in Great Britain, only a third thought Die Hard was Christmas film. We in the states know better. Merry Christmas Paula, and to Tim as well.